The DEFRA figures show the true cost of butter fat suppression in the dairy herd, especially as many buyers moving to a contract with a bigger emphasis on constituents. The main cause of the butter fat drop in grass fed diets is that there is insufficient slow pool fibre to balance the energy and protein in grass. The fibre in NIS is digestible slow pool fibre, NIS is an ideal ingredient to use to compliment grass diets. Including NIS in the diet of a ruminant with loose dung will increase butterfat, firm up the dung and increase rumen efficiency. 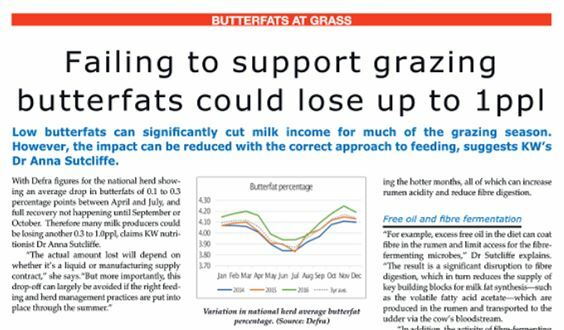 To read the full article from British Dairying June 2018 please click on the image below.